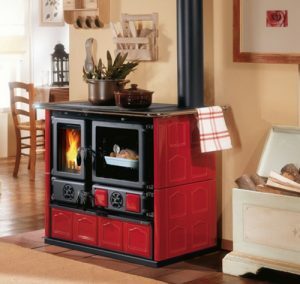 The Rosa Maiolica by La Nordica is, without a doubt, a stunning example of a modern cookstove. Available in striking burgundy red (as well as cappuccino and white), the Rosa’s exterior is both bold and elegant with an eye towards function. 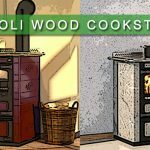 The large glass doors for the firebox and oven allow you to keep watch on your cooking while enjoying the ambience of wood heat, while a wood drawer cleverly positioned below the firebox gives you the ability to quickly dry out your wood prior to burning it. La Nordica has put some thought into the cooking experience, too. The Rosa’s oven is sizeable, made from easy-to-clean porcelain and features a thermostatic probe built into the glass door that allows you to easily monitor the progress of your meal. These seem like common-sense features after only a few uses, a sign that you don’t have to redesign the wheel to make modern improvements to an age-old idea. 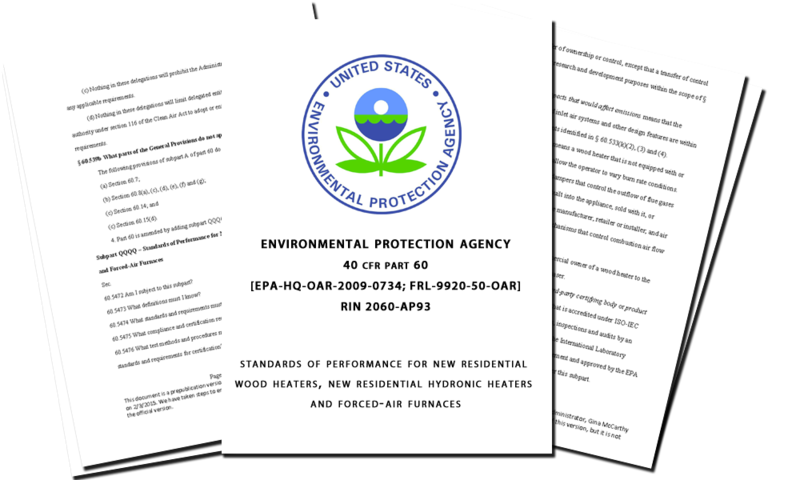 The Rosa Maiolica meets not only EPA standards, but also those of Washington state (which has some of the strictest emission limits in the United States). The Rosa’s ability to be so efficient with its emissions is due in large part to a robust construction, and the moment you lay hands on this cookstove you’ll feel the quality. While some modern cookstoves are destined to be the centerpiece in any room they are installed in, the Concept 2 Air aims to be understated without sacrificing elegance. This is a proper cooker, designed with an intense focus on cooking and baking rather than heating (although, with its sturdy steel construction, the Concept 2 Air can certainly handle outputting a great deal of warmth). 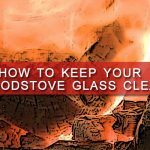 Keeping the face of this stove clean is made easy as the glass doors on both the firebox and oven make use of built-in openings for secondary air flow, preventing the buildup of soot. The Concept 2 Air has a smaller firebox, but it makes efficient use of it with excellent engineering that ensures the optimum amount of heat is transferred from it to the oven. As a bonus, this stove allows you to use both wood and coal as a fuel source, something of a rarity in cookstoves, and another feature we particularly love about the Concept 2 Air are the dual controls. 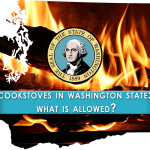 Nothing says “this is a modern cookstove” quite like being able to regulate the temperature of the oven independent of the firebox. Check out the video below to learn more about the Concept 2 Air cookstove, as well as the excellent hydro version. 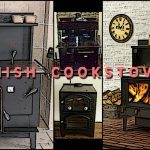 The North Hydro Boiler Cookstove by Tim Sistem offers a feature that few other modern cookstoves do: It allows you to plumb into an open or closed loop boiler system, meaning you can use the stove to heat your home with hot water. 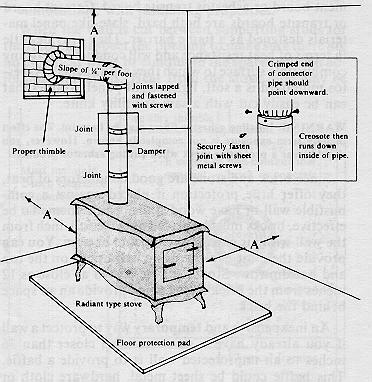 This is massively useful for anyone looking for creative ways to be self-sufficient, especially if your home demands a more robust system for heating than the firebox of a cookstove can offer. Plus, with a 6″ clearance to combustibles, the North Hydro can fit safely into some unexpectedly tight places. 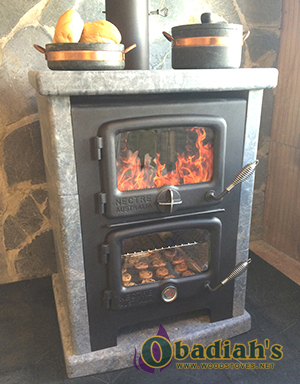 Like other modern cookstoves, the North Hydro has a sleek exterior and is offered in either stainless steel or black. It may not be particularly bold in design, but the subtle quality of the hinges and levers works with the outstanding air-wash system to give the face a look that will fit right into both modern and traditional homes. 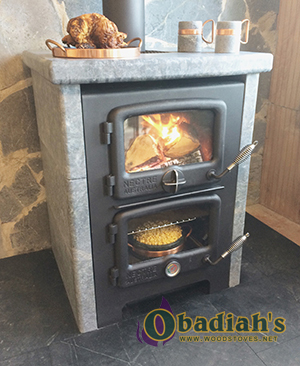 One aspect of any modern cookstove that has become increasingly important to homeowners is wood-burning efficiency. 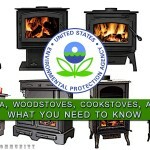 With EPA regulations recently increasing and many states tightening up their own restrictions on wood-burning devices, a cookstove that burns exceedingly well is often the only option for many. De Manincor recognized that need, and has stepped up to the task with their Eco Series wood cookstoves. 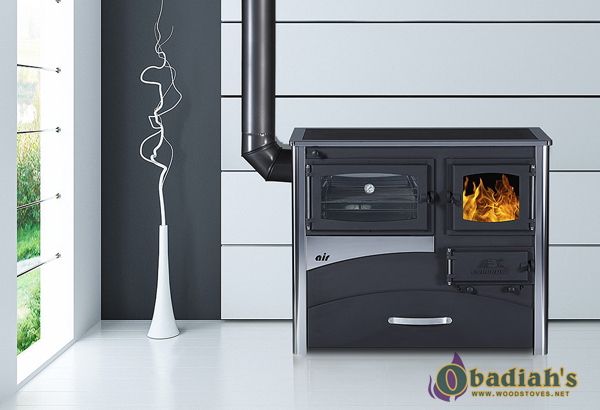 The Eco 80 and 90 utilize de Manincor’s Ecoplus combustion system, which allows secondary airflow to pass over the flame, burning off remaining gas. This process reduces particulate emissions further than most cookstoves, and reduces waste over time, meaning the stove runs cleaner more often and for longer. 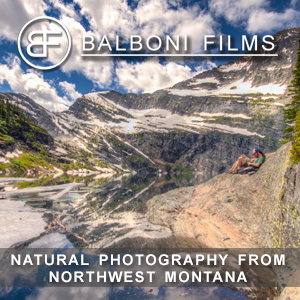 It meets both EPA and Washington state standards for emissions, so no matter where you are, chances are the Eco Series will pass any local air regulations. 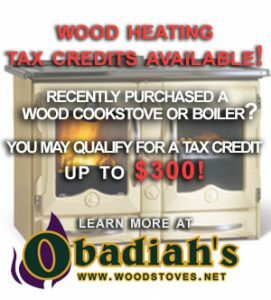 Not only are they efficient, but the Eco Series cookstoves have a smaller profile than many stoves, meaning you have more options for installation locations. You can see the full dimensions of each here. 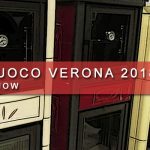 While the Eco Series cookstoves are designed to be eco-friendly, but that doesn’t mean the aesthetic suffers. 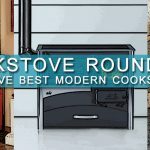 Both the Eco 80 and 90 are offered in a wide variety of color options (including blue, red, yellow, ivory and more), and on the whole, these are very user-friendly cookstoves. 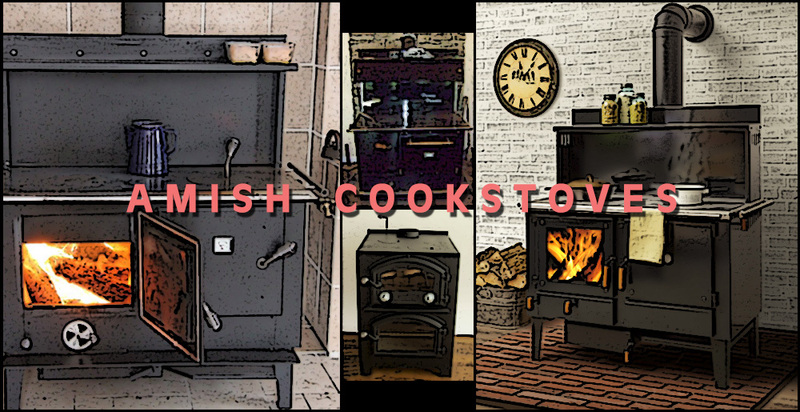 Even if you’re a little new to the world of cookstoves, you’ll be pleased with the Eco Series. 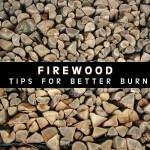 It can be hard to find any wood-burning stove with a small footprint, much less a modern cookstove. We did though, and surprisingly the design originated in Australia of all places. Now made in North America, the Bun Baker is a fascinating mixture of modern and traditional aesthetics, with a classically-inspired face underneath its sleek soapstone veneer. That’s right, soapstone. 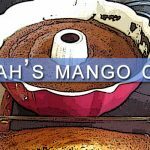 While the Bun Baker is available without it (that model is called the “Baker’s Oven”), the difference with it is like night and day. 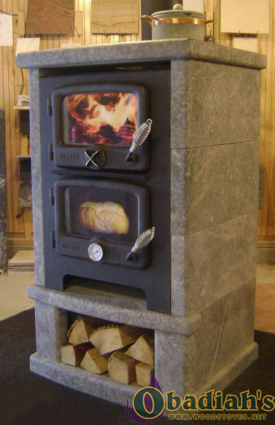 Soapstone is widely known for its ability to retain heat and radiate it back out after absorption, so by installing a veneer of soapstone around the exterior of the stove, you drastically increase the length of time you can heat your living space. 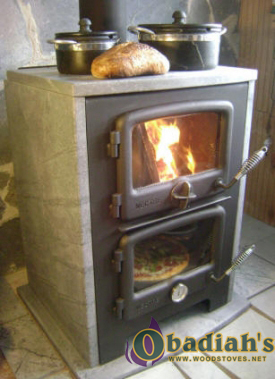 You can think of the Bun Baker’s soapstone like a battery: As the temperature in the firebox rises, some of that heat is transferred into the veneer, where it is stored and naturally dispersed at a gradual rate that will typically outlast your actual fire. 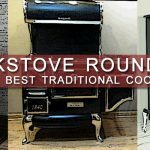 A soapstone veneer is not the only thing that makes the Bun Baker one of the most unique modern cookstoves, however. It also offers a stacked designed, with the firebox and oven vertically aligned to make the most economical use of your floor space. 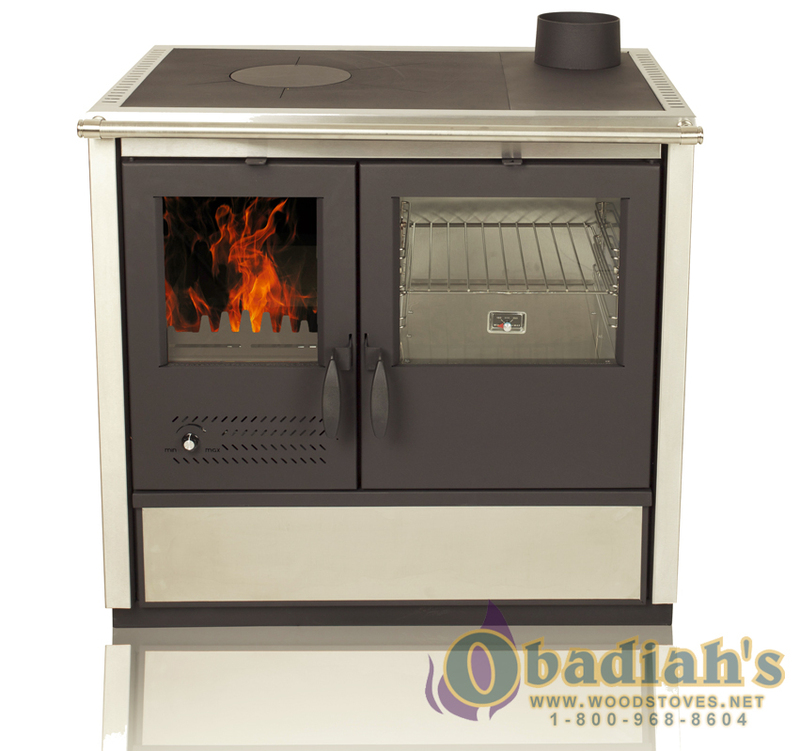 This compact design lends itself incredibly well to cozy living spaces like a cabin or rural retreat, yet the heat output is nothing to scoff at. 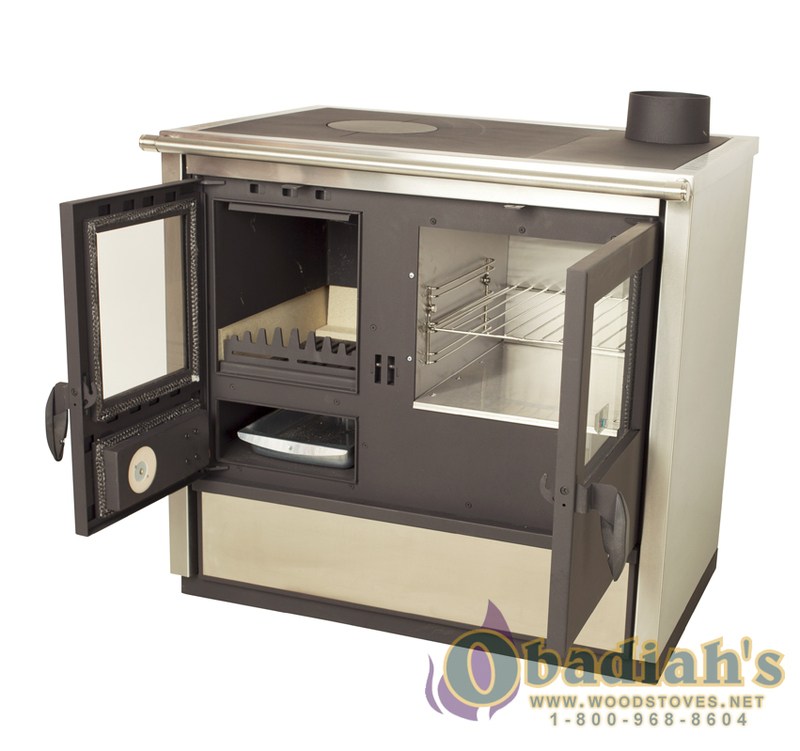 At 30,000 BTUs an hour, the Bun Baker stands tall for its size when it comes to heating. 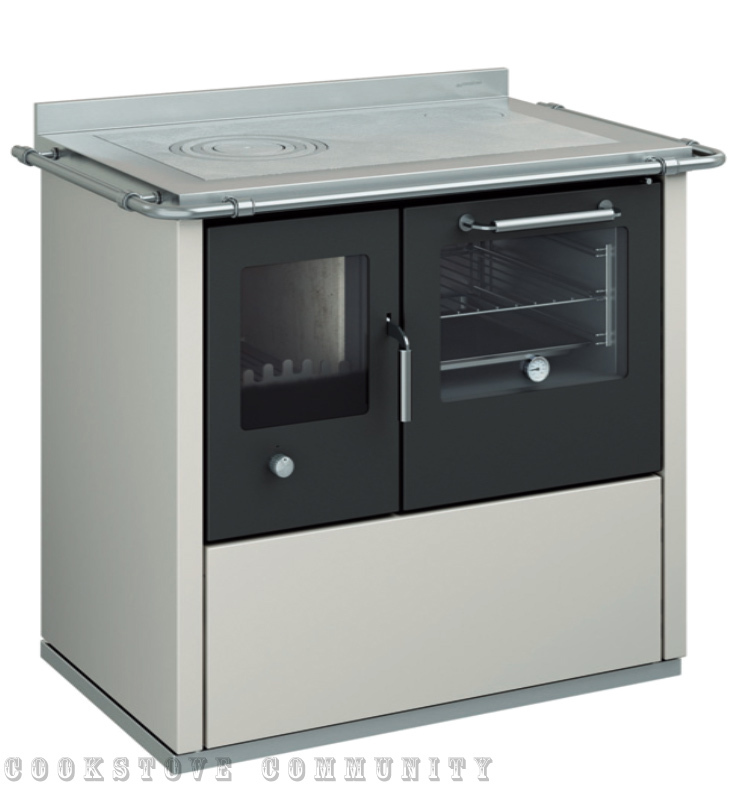 The Bun Baker is available in a multitude of other models as well, which range from the basics to those including a hearth and even an extra space for wood storage.